As the name indicates, the supercapacitor is a specialized form of the capacitor with an exceedingly high level of capacitance. They are electrochemical capacitors that have an unusually high energy density when compared to common capacitors, typically several orders of magnitude greater than a high-capacity electrolytic capacitor. Their storage capacity is incredible, currently up to 650 Farads. Maximum voltage: There is a maximum voltage for ultracapacitors. Other types of a capacitor can be manufactured to operate at high voltages, but supercapacitors are generally restricted to operating voltages in the region of 2.5 – 2.7V. It is possible to manufacture them for operation above 2.8V but it is found that the operational life is reduced. Series operation: In order to achieve higher operating voltages for supercapacitors, they can be placed in series. 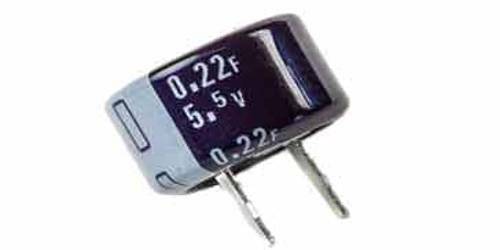 This reduces the total capacitance as is the case with any capacitors placed in series. Also if more than three capacitors need to be placed in series then it is necessary to implement voltage balancing techniques. As the leakage currents through the capacitors are likely to be different, the voltage split across the capacitors will not be equal and one or more may enter and over-voltage position. 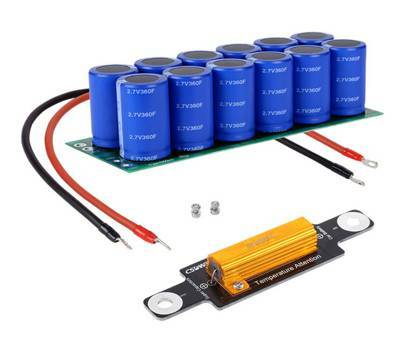 Self-discharge: Self-discharge of supercapacitors can be an issue in some circumstances. It results from the electrolyte used and it means that the energy stored can decrease by 50% or more within about a month or so. By comparison a nickel-based battery (NiCd or NiMH) self-discharges by about 10% or more a month and a Li-ion battery by about 5% a month.